Dental care can be expensive if you do not use an in-network dentist. Dr. Joe Isaacson strives to make dental care more affordable and accessible, which is why is he is a Blue Cross Blue Shield dentist in Oklahoma City. As an in-network dentist for Blue Cross and Blue Shield, you will maximize the value of your dental insurance plan to receive the comprehensive care you need. Dr. Isaacson provides the extensive services your family needs while making dental care more affordable as an Oklahoma Blue Cross Blue Shield Dentist. 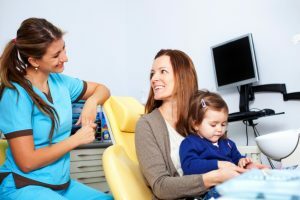 Blue Cross Blue Shield offers a number of different dental insurance plans, with each plan offering a specific percentage off your out-of-pocket dental care costs. To maximize the value of your dental insurance plan, you need to choose an in-network dentist. By choosing an in-network dentist, you will receive the preventive care you need to keep dental costs to a minimum. With regular appointments to your dentist, you will keep dental problems at bay while receiving the interventions you need to address dental problems before they become even bigger. Depending on the plan you currently have, choosing an in-network dentist can cover preventive care up to 100 percent. Should you require treatment, your insurance plan will cover a portion of the services and treatments you need to restore your oral health. In addition to preventive care for the entire family, Dr. Isaacson offers a wide range of services, including an array of specialized services. To restore the health and function of your smile, Dr. Isaacson provides restorative services, including replacement teeth, crowns and bridges, and dentures. To keep your smile looking its very best, he also offers a diversity of cosmetic procedures. No matter if you need to brighten your smile with professional teeth whitening or want to straighten your smile with Invisalign, he will give you the dazzling smile you want while working with your insurance plan. Dr. Isaacson is also able to provide specialized services to meet the needs of all of his patients. For those who are fearful of the dentist, he offers sedation dentistry to help you relax. He also simplifies dental procedures while enhancing your comfort through the use of dental advancements, like laser dentistry. Using the highest quality of care, he will replace missing teeth with dental implants or transform your smile with Lumineers. As your trusted family dentist, Dr. Isaacson is always here for your family, even during emergencies. As an emergency dentist, he makes difficult times a little bit easier by providing the exact services needed to quickly treat an array of dental emergencies. Dr. Isaacson understands that the cost of dental care is a leading reason people avoid visiting the dentist. He does not want to see you place your oral health at risk due to the affordability of dental care. Benefit from the best dental care possible while staying within your financial budget by choosing an in-network dentist for Blue Cross Blue Shield. Contact Dr. Isaacson’s office today to schedule an appointment.